Hello all and thank you so much for stopping by today! I am excited to be joining Pretty Pink Posh for their March 2016 release blog hop (more on that below). 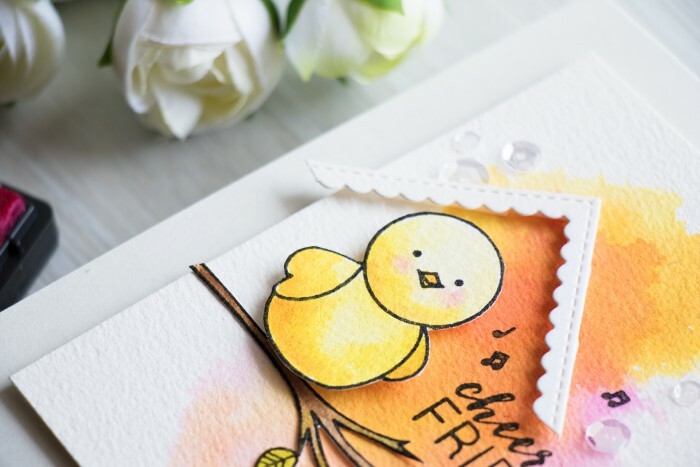 Today I’d like to share a fresh Spring card featuring ink smooshing and a bit of creative die cutting. 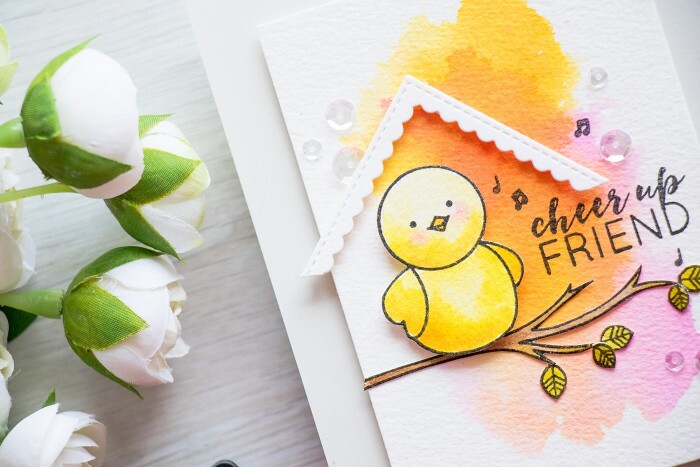 The idea was to create a card with a little chick sitting on a branch in a bird house. That took some trial an error, but I’m happy to say I love the way this turned out. I started working by on my card by creating an ink smooshed watercolor background. I used Distress Inks (Mustard Seed, Wild Honey and Picked Raspberry) and Arches Cold Press Watercolor Paper. I love using this particular paper for its high quality. Once I was happy with my background I created my main characters – the chick, a branch and a few leaves. All of these were stamped in VersaFine Onyx Blank ink and watercolored with Distress (Mustard Seed, Wild Honey, Picked Raspberry, Gathered Twigs and Crushed Olive). The images were fussy cut (although there are matching dies available) and adhered onto the background. 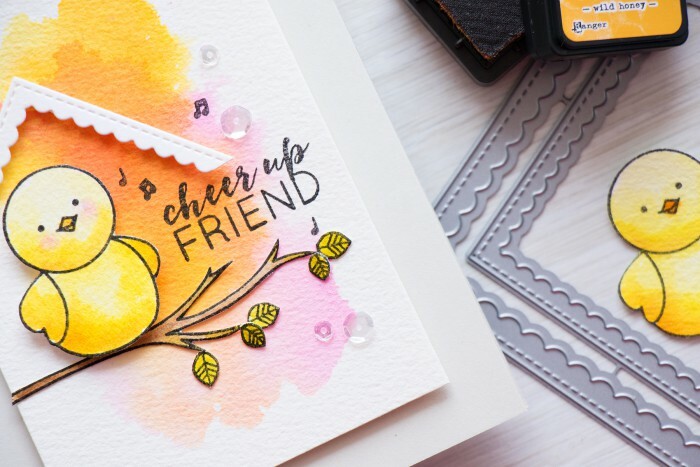 I also stamped a Cheer Up Friend sentiment and added several music notes to make it look like the bird is singing. The create the bird house I used Scallop Squares Dies and die cut only a corner, I foam mounted that onto my panel and created an illusion of a bird house. Finally the panel was foam mounted onto a card base and embellished with a few clear sequins. Hop along with Pretty Pink Posh and amazing designers for loads of creative inspiration. If you arrived from Amy Kolling the next stop on the hop is Joni Andaya. If you get lost or encounter a broken link please start at the beginning at Pretty Pink Posh Blog. There are two $25 gift certificates up for grabs. Winners will be picked randomly along the blog hop. (Comments must be left by 11:59 PM PST on 3/14/2016. Winners will be announced on the PPP blog). Such a cute card, thanks for the tutorial! Your cards are always just too darn cute ~ and I loved the video…….. You inspire me always! I always love your cards ~ and thank you for the video. I’m so happy that you have joined Pretty Pink Posh. I love everything she creates! Your card is very creative! Simply perfection! 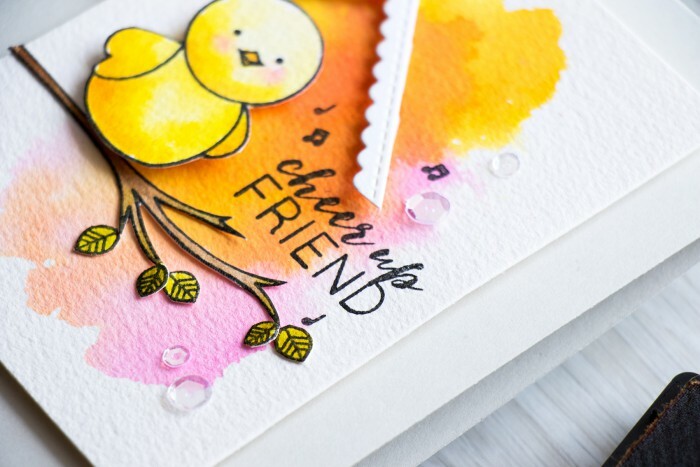 It’s also,good to hear that designing a great card can be hard work, even for a super talented and creative crafter like you! you are making me blush, Marianne! Thanks so much! What a darling card!! I love the colors you chose and that smooshed background is just fantastic! Love this cutie patootie with your fab colors! WOWZERS! This is so CUTE! I love the watercolor background! Thanks for the video! Chip, chip, chip. That means wonderful, wonderful, wonderful in bird language. Your faux birdhouse is trememdous. That’s going into into idea storage in my head and hope it does not get lost there because I really, really want to card lift your wonderful idea. Thank you. awww! thank you so much, Bobbie! Love your cards as always!! I love this happy, happy card! Love your use of color!!! Very sweet card. I love the way you used the scalloped square die to make a roof for your birdhouse! Loved the card. Awesome use of the die cut. I love the background on the birdie card. It really makes the card pop! Thanks for the video tips! Lovely card, so creative how you used the die to make a little roof. Love the bird house affect!! Love watching your videos and am a follower! You inspire me so much!! 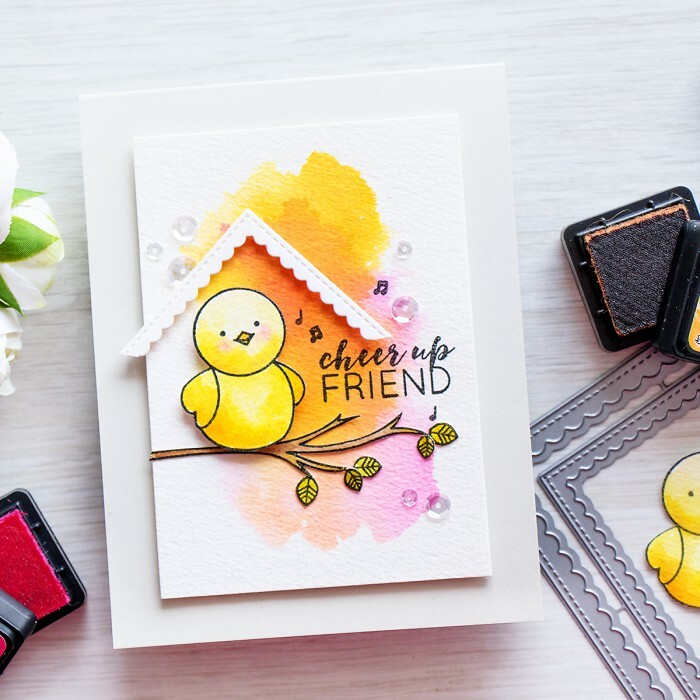 Your birdhouse affect is such a great idea and love the gorgeous colored background!! Am a follower and you inspire me! Beautiful card & such a creative way to make the roof! Such a cute card! 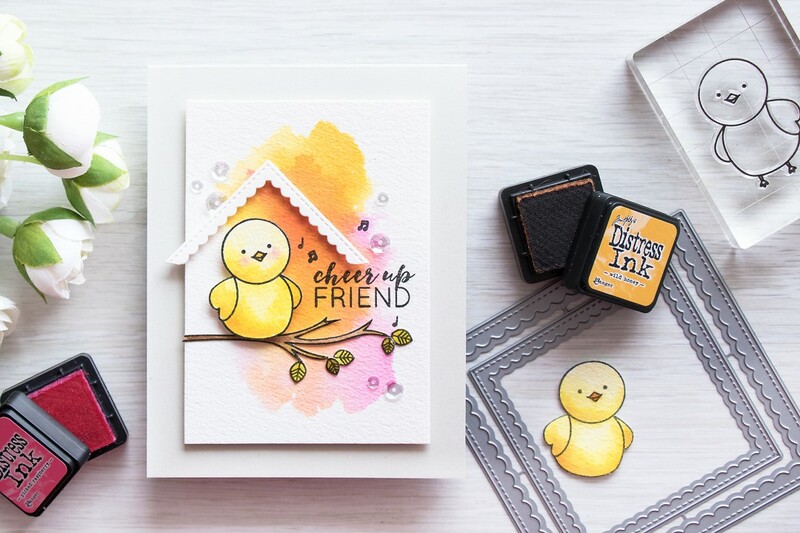 Love your smooshed ink background and the illusion of a birdhouse! Your card is adorable! I love your “bird house illusion” 🙂 I’m definitely going to try this background technique!